Who can resist the smell of frying bacon wafting up the stairs and into your sleep on a sunday morning? Well, probably not me. I have to say, however, that I ever since meeting Pickles the tiny porker back in January I’ve felt a little guilty for snacking on the flesh of her sweet and sour bretheren. Eating something you once knit a jumper for takes a guilt mastery that I have become shamefully skilled at. Nowadays I munch bacon butties without a thought for my porcine pal. Until something comes along to wobble my carnivorous pedestal once more. 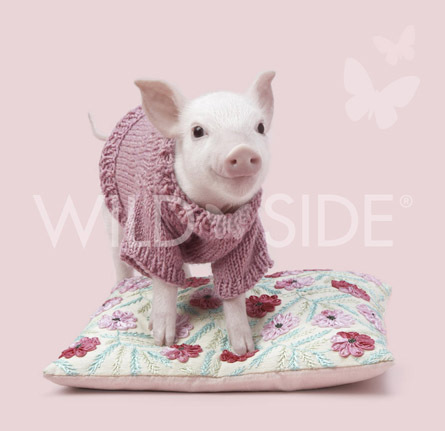 Pickles really went to town on sticking to the pig stereotype and sadly outgrew the jumper in the week it took me to make it. That was despite it being adjustable to allowed for the pigging out that was quite likely to occur. Lucky for all concerned there is no shortage of pretty pigs in London and the folks at Wildside quickly drafted in a slimmer model to fill the sleeves of the pudgy Pickles. So here, for all of you who have waited patiently for a glimpse of the swine in my stitching, is the slim and sassy sow they call Pandora. Photograph ©Wildside Not to be used elsewhere. Please contact them with any requests. For now I shall push away sausage sandwiches and have a nice salad instead. ADORABLE! How did you ever get such a great shot? Fabulous work! Thanks everyone. She’s far too cute. And yet so tasty. Wow! This is the cutest thing ever. I love the baggy sleeves. DO NOT EAT ZE PIG! P.S. Your cluster map looks like some kind of diagram of a global pandemic. I agree. Forget the pork and bring on the carrots. Too darn cute! Back away from the pig…and send her to me in the U.S.A. Does this give new meaning to the term “dressing for dinner”?? I’m readying bbq sauce… that’s all I’m sayin’. Adorable! How can you make Babe cuter… ? Knit him a lil pink sweater! That is the cutest photo I’ve seen in ages! This is wonderful what awesome work did. Really looks nice!